Underwater artists of all ages used dive knives and fine carving tools to transform their orange gourds into sea creatures. 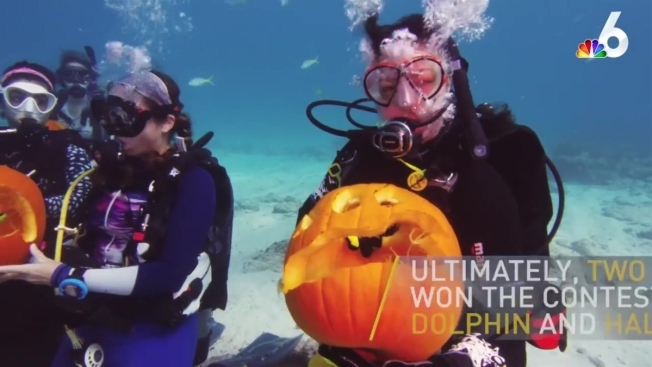 A creative group of scuba divers submerged 30 feet beneath the surface in the Florida Keys to carve pumpkins. The event took place at the annual Underwater Pumpkin Carving contest that took place Sunday near Key Largo. Underwater artists of all ages used dive knives and carving tools to transform their orange gourds into sea creatures. Participants were also challenged to keep the hollow, naturally buoyant pumpkins from floating off while the artists worked their magic. Sebastian Gimeno, 16, and his brother Gabriel, from Weston, impressed the judges with their dolphin and half-moon cutout to win a dive trip. Other pump-kin entries included sharks, a sea horse, an eel, sea turtle and a skeleton fish.